The return of Baroque freedom. The most famous variations, as written by Bach. A return to basics. These variations were written by Bach for 2 keyboards harpsichords. For this reason, they are considered “almost impossible to perform” on the piano, without making any adjustments in the distribution of the notes between left and right hand. According to some musicologists, Glenn Gould was the only one who was able to perform all the Goldberg Variations without any adjustments. However, by analyzing his videos it is easy to see that the Canadian pianist had in fact made some modifications. For instance, in the Variation No. 11. 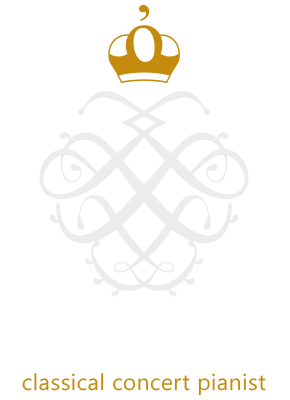 Stefano Greco performs the entire work without any adjustments, in order to keep, in his gestures, a more rigorous behavior and obedience and better realize the alchemy of this music. In Greco’s execution, the tempos are not chosen according to aesthetics. They are the result of mathematical proportions that are hidden in Bach’s music. The consequence is a performance that sounds new, somewhat shocking, compared to the usual interpretations. Though this performance is strengthened by precise indications of the composer, among which there are even the note values. As an example, Bach took the trouble of asking his son-in-law Altnikol to copy the Prelude in B flat minor BWV 893 of the second book of the Well-Tempered Clavier with semiquavers rather than quavers, because he wanted it played faster. In the light of this, it seems really strange that some Variations, normally performed very slowly, were written with 32nd and 64th notes (the fastest possible notes). In order to turn the traditional concert into a more involving experience, it is possible to use a big screen and to project the images taken by a camera that is positioned on the keyboard. This way, the public could see the spectacular crossings of hands. Duration: 60 minutes + talk. Alice Tully Hall – Lincoln Center (New York, USA); Castleton Theatre (Virginia, USA); Opera City Concert Hall (Tokyo, Japan).